My dinosaur guards my Persianized green smoothie! I pretty much live on green smoothies – a blending of yogurt and veggies and fruit. My blender is the hardest working member of the household you might say, I suppose, and it is not entirely rewarded for its labor, save for showing signs of wear and tear. No day spa for my (non union) blender! Oh no! 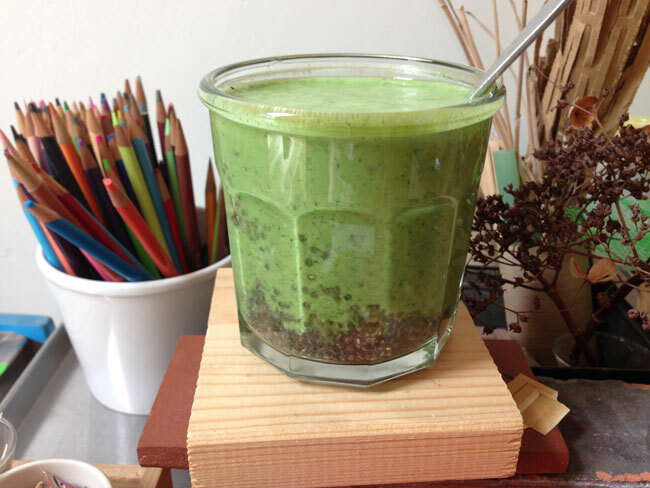 My green smoothie concoctions have served me well, morphing here and then with seasonal ingredients and moods. I’m a creature of habit when it comes to what goes in my smoothie, a serial monogamist, that is to say I’m loyal to a fault to a particular combo until one day, I’m not, and boom, it’s time to move on! There was a time when I was fixated on using macca powder and goji berries; there was that time when flax seeds were a must; there was a bout of using soy or almond milk instead of dairy but for a long while now, I have a very streamlined staple list of ingredients. Right now my magic formula for making a delicious and super healthy green smoothie potion is to take a whole bunch of fresh kale (at least 2 cups, use more to thicken smoothie, less if you like your smoothie with less “grassie” flavor) a large ripe banana (a MUST ingredient, as it is the only sweetening agent), water to dilute (one cup or more depending on how much kale I use) and one cup of whole plain yogurt. That’s it. And it’s great — a balanced if not dazzling flavor. But recently I’ve also been on a kick of Persianizing my green smoothie and have concocted my own mixed spice Persian advieh that hits the spot and delivers a punch of health benefits into the bargain. It’s a keeper! What does it takes to Persianize my green smoothie? dried mint, senjed powder, chc chc chia seeds (remember I just posted about they myriad goodness of chia seeds last week) turmeric, and dried rose powder. Not pictured but an exquisite and requisite little touch for both health and that je ne sais quoi touch: rosewater and saffron water! The reason smoothies are so popular is that they deliver lots of nutrients in a few smoothly delicious gulps. Without further ado, voila presto my favorite Persianized green smoothie’s recipe that makes two delightful frothy servings. Dinosaurs not included! Combine all the ingredients including (except for chia seeds, saffron water and rosewater) in the blender and blend till you have a smooth consistency. Add chia seeds, saffron water and rosewater, and stir to mix. Serve in a glass. Sip and enjoy! Make it, enjoy it, and nooshe jaan نوش جان! This looks so good. I love that you added saffron and rosewater. Amazing. I hope you’re well Azita and wish you a lovely fall season. Anything Persianized sounds good to me!! Hi!! I was also curious about the rose powder. can you recommend a brand or source please? Also, what does senjed powder taste like and where can I find that? Thank you!! Love the unique take on the every popular green smoothie!